RYC #4: Buttons! | Rosi G.
The top ones are flat, more ornate. The bottom ones have a little peak in the middle (not flat). I can’t decide! Which button for my CPH? Looks like I’m alone in the top row love. Those are cool as hell! I like the top row ones, I think the swirl pattern is beautiful and you can see the details in the button more on these than on the others. I love those top row buttons too. With the color of the yarn,, it just clicks. I think you should use both. Hey..well I like them both, but going with the bottom row. Howevah! I wish I had your button shops!! 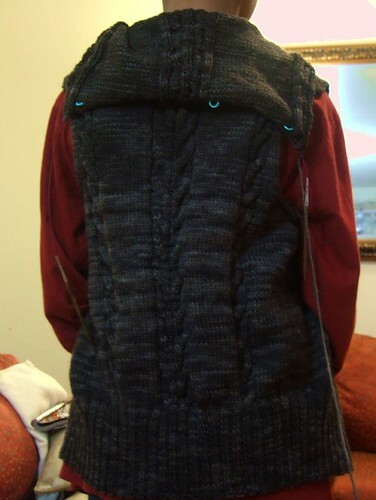 I will be needing some silver buttons for my FLS. I’m jealous! I must say, the top ones are my favorite. There’s a lot going on, but not too much. I thin they’re just right! It seems everyone is divided. I think ultimately you will have to make the final decision. My vot eis for the bottom row of buttons, but honestly you can’t go wrong with either one! I love ’em both, but lean toward bottom. Where’d you get them? do they have more that sort of style? 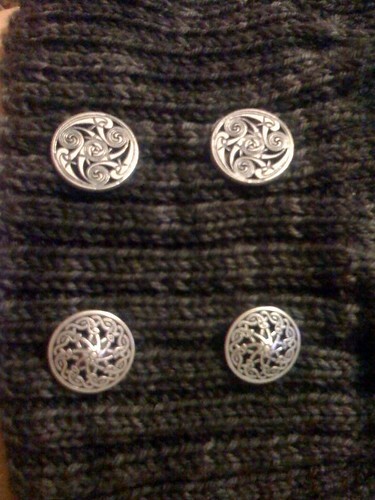 I like the top ones, because I’ve never seen buttons like those before! The bottom row gets my vote. The CPH is a textural piece, and deserves textural buttons imo. I don’t know how I would choose either. Both are wonderful. However, I think you should mail me the buttons that you don’t use!